Once someone develops symptoms associated with FAI, it is unlikely that the problem will just get better and go away. However, that does not mean that surgery is always the best first line of treatment. There are a number of nonsurgical strategies that can be utilized. Treatment may begin with something as simple as just identifying what activities may have triggered the onset of pain and then adjusting these to avoid symptoms. For athletes, you cannot really change what they do in competition, but adjustments can be made in training, especially avoiding maneuvers that load the hip in a flexed position, such as deep squats and lunges. Since there is a significant dynamic component to the problem, a pelvic and gluteal strengthening and stabilization program can do much to reduce the forces across the hip and diminish symptoms. Remember that symptoms often come from compensatory soft tissue problems, which can be improved with supervised physical therapy, often regaining one’s ability to compensate for underlying FAI. 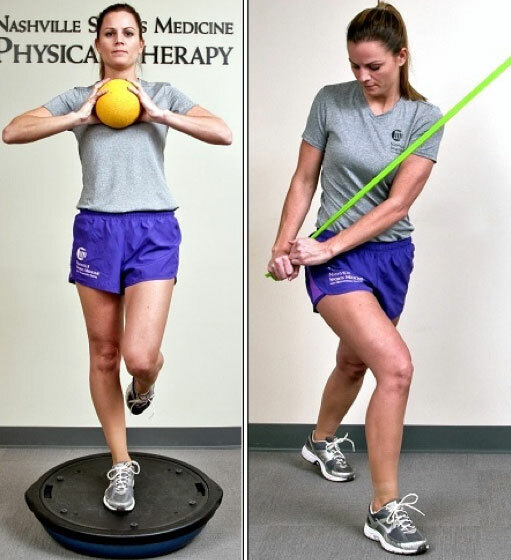 Pelvic stabilization exercises can reduce the forces across the joint created by FAI and can help to correct accompanying compensatory problems. Anti-inflammatory medications are a mainstay in helping with symptoms. These work to reduce painful inflammation associated with FAI, which may reduce discomfort and secondarily help improve function. In general, they are not going to mask over a worsening problem but are also not a solution in themselves. They may be especially beneficial when used in conjunction with other conservative measures. Sometimes it can be a challenge to determine how much the joint (FAI) is the problem, and how much of symptoms can just be coming from the soft tissues around the joint. In this circumstance, a diagnostic injection of anesthetic (numbing medicine) into the joint can be quite useful to differentiate how much the hip is a source of pain. The numbing medicine in the joint may last for an hour or two and give the patient an opportunity to move around and simply see how much of their pain temporarily dissipates. This injection can be performed under ultrasound in the office and takes only a couple of minutes. (Related Study: Ultrasound-Guided Hip Injections: A Comparative Study with Fluoroscopy-Guided Injections) Since so many FAI problems also have concomitant problems outside the joint, the diagnostic injection can be helpful to both the clinician and sometimes especially the patient to appreciate how much of their pain can be blamed on the FAI and how much may be from other sources. Ultrasound guided injections have great diagnostic and therapeutic value for numerous disorders around the hip. It just takes moments, and scientific data from this center documents how well tolerated it si by patients. Judicious use of cortisone inside the joint can sometimes be performed even while putting in some anesthetic. Cortisone is simply a potent anti-inflammatory medication that may reduce inflammation within the joint and diminish symptoms. The chemical effect of cortisone may last for four to six weeks but sometimes can help break a cycle of inflammation and result in long-term improvement. More practically, if the joint’s irritable, it may provide a window of time while the joint is feeling better and allow a patient to work on surrounding soft tissue symptoms, which are normally best addressed with supervised physical therapy. In the presence of more severe arthritis, cortisone injections may provide sufficient improvement to postpone the eventual need for a hip replacement. Repeated cortisone injections are usually avoided in non-arthritic circumstances. With structural problems like FAI, habitual injections are just treating the symptoms and not addressing the underlying problem. In the long run, this can prove to be detrimental. Again, on a one-time basis, this may be appropriate, especially as part of the effort to exhaust reasonable conservative treatment before opting for surgery. The damage associated with FAI can worsen with time. If the symptoms are stable, there is no sense of urgency to rush towards surgery. If the symptoms are worsening despite efforts at non-surgical management, then it is probably best to be proactive and recommend surgical intervention rather than continue with a wait-and-see approach. Most FAI problems can be addressed with arthroscopic surgery through small puncture incisions as shown here. Fortunately, most cases of FAI can now be addressed arthroscopically; but there are still numerous complex problems that can only be properly corrected with an open approach. This decision has lifelong consequences for the patient and thus it is imperative that the surgical team be accomplished in both methods in order to make the right choices for each person. Regardless of the surgical method used, the preoperative planning is important to understand the bony architecture that needs to be addressed and also try to understand as completely as possible any other dynamic contributions. However, ultimately the pattern of joint damage observed at the time of surgery will definitively influence exactly what and how much bony correction needs to be done. Keep in mind, that even the best MRI’s are not perfect at detecting all joint damage. In general, MRI’s are best at determining damage to the labrum, but less reliable at showing problems of the articular cartilage. Ultimately, it may be the extent of articular damage that is the limiting factor on the success of the operation, and this will only be determined during the procedure. Statistically, it is unusual to have isolated damage to the labrum and perfectly normal articular cartilage; so most times it is best to just assume that the extent of articular problems may be greater than suggested by MRI, and this will be conclusively defined at the time of surgery. During an arthroscopic procedure, the extent and pattern of labral damage mostly influences how much of the acetabular rim needs to be trimmed (acetabuloplasty), and the articular cartilage injury guides the extent of reshaping of the femoral head to correct the cam bump (femoroplasty). (Related Study: My Approach to Femoroacetabular Impingement) The torn labrum can almost always be repaired. Occasionally, it may be better served by just cleaning up the damaged portion. Damage to the articular cartilage is usually smoothed off (chondroplasty). If areas of articular damage down to exposed bone are present these are often treated by placing small holes into the bone to create vascular channels for healing (microfracture). Other problems such as cartilage debris, synovitis, damage to the ligamentum teres and sometimes even loose bone fragments can be addressed. A labral tear indicating damage due to Pincer impingement is being probed. Delamination of the articular cartilage of the acetabulum is being probed, indicating damage due to the femoral bump of CAM impingement. 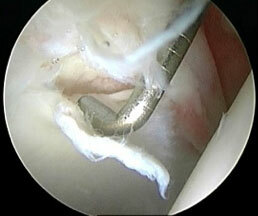 Sutures are passed through the labral tear and the repair is then inspected from inside and outside of the joint. The Cam lesion (*) first has overlaying soft tissue removed and then is recontoured; recreating the normal slope at the junction with the femoral head articular cartilage. Grade IV articular cartilage loss of the acetbulum with exposed bone. A Microfracture is performed creating multiple perforations in the bone to stimulate a fibrocartilaginous healing response. The success of any operation is very much dependent on the supervised physical therapy (PT) rehabilitation process. (Related Study: Rehabilitation of the Hip) In fact, many patients can benefit from therapy prior to surgery (“prehab”) in order to get the hip in better shape for the surgery to be successful. Sometimes other problems, such as compensatory disorders, may be such an overriding issue that PT is essential to correct these secondary components before surgery can even be considered. The specifics of the rehab strategy following surgery are determined by exactly what was done during the operation. In general, the first 12 weeks are more of a formal structured rehabilitation process; and the next 12 weeks are more of a functional progression based on how the joint is recuperating. Return to full activities is normally expected at 4 to 6 months, depending on how the hip is responding and the extent of the joint damage. Keep in mind that a surgeon can never make the joint truly “normal”. No one can make it as good as your Creator gave you to start. Thus, for some people where all of the damage cannot be completed corrected, some long-term activity modifications may be important in order to better protect the hip looking into the future.